If you’re looking for something to “happen” in the market, one place to start is in high-momentum, high-volume stocks that haven’t been doing much for a while. With that in mind, let’s take a look at two stocks from two very different industries that present two distinct, but related, pictures. Possibly lost in all the hoopla surrounding the US equity market’s huge first quarter was the fact that crude oil staged its biggest Q1 rally since 2009: May WTI crude oil futures were up 28% at the end of March, and as of yesterday that gain had expanded to around 33%. Traders may be anticipating a breakdown in the stock if the test of support coincides with a slowdown or reversal of the crude rally. 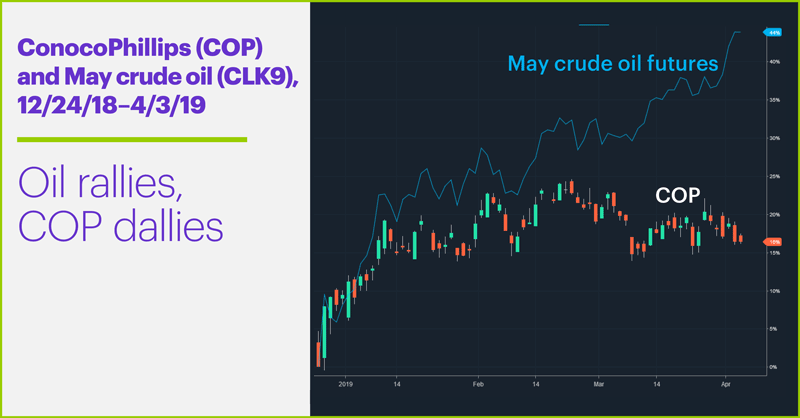 The move has been a boon for many big oil stocks, including ExxonMobil (XOM) and Chevron (CVX), both of which boast double-digit year-to-date percentage gains, despite lagging the crude market’s return. 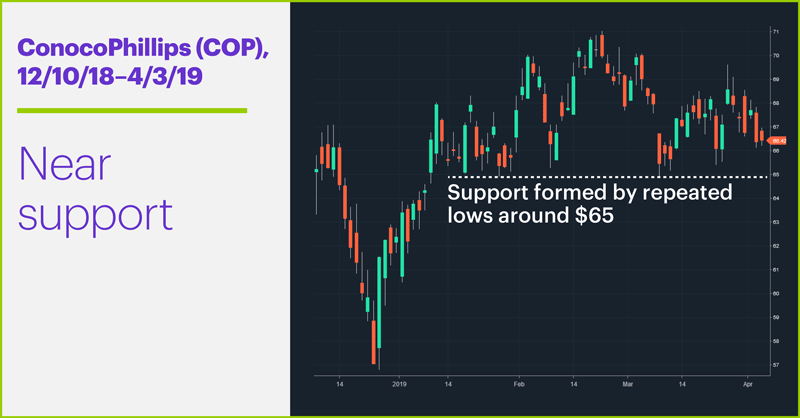 Since a two-day upswing in late-March, COP has edged back toward this support level. At the stock’s price around noon ET yesterday ($66.20), even a decline that simply tests (again) the support level represented a 1.75% down move. And some traders may be anticipating a breakdown of the support level (and a more significant decline) if that test coincides with a slowdown or reversal of the crude rally, something that can’t be ruled out given how hot the market has been recently. Yesterday morning, though, the stock transitioned from threatening to break out to actually doing it, rallying another 2% to its highest point since last August. But it turned out to be a short-lived move: The stock reversed later in the session, falling back below the breakout level and dropping into the red on the day. So is this breakout story over? Yesterday was just one day. "False breakouts" like this occur all the time, which is why many traders want to see a stock close above (rather than just penetrate intraday) a breakout level before lending credence to an upside breakout. That could still happen. Longtime traders also know that after an initial breakout surge, prices often pull back to (or a little past) the breakout level before resuming their move. In other words, there will likely be plenty to watch in these stocks in the coming days. Note: FB is scheduled to release earnings on April 24, COP on April 26. 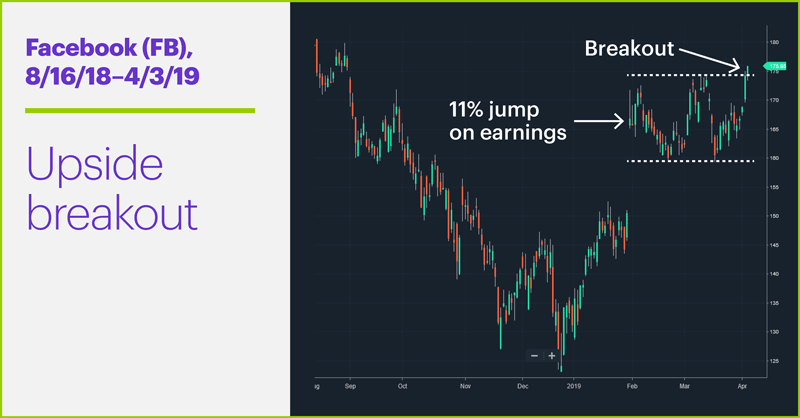 Market Mover Update: Semiconductor stocks surged yesterday, including a 5% intraday jump in Micron (MU) and a nearly 4% rally in Nvidia (NVDA). Santander Consumer (SC) popped 2.4% intraday. Today’s numbers (all times ET): European Central Bank (ECB) minutes (7:30 a.m.), EIA Natural Gas Report (10:30 a.m.). Today’s earnings include: Constellation Brands (STZ), RPM (RPM). 1 StreetInsider.com. Facebook (FB) PT Raised to $190 at Morgan Stanley. 1/31/19.